Just a little over 24 hours before No. 12 UCF and No. 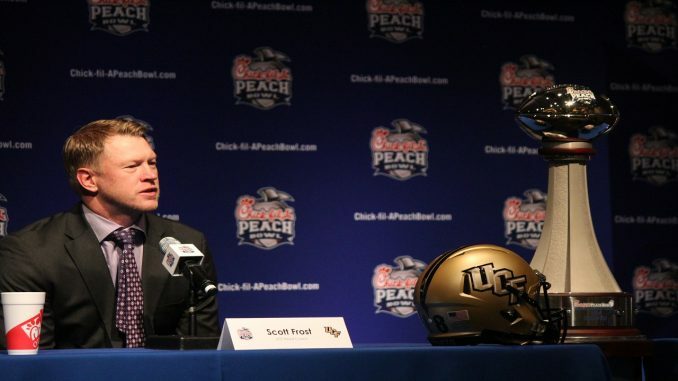 7 Auburn match up in the 2018 Peach Bowl, coaches Scott Frost and Gus Malzahn spoke to media about what they are expecting in what is speculated to be one of the best games of the current bowl season. While Malzahn broke the news that Auburn (10-3, 7-1 SEC) junior defensive back Carlton Davis will be sidelined during Monday’s game, former UCF (12-0, 8-0 AAC) coach and new Nebraska coach Scott Frost kept the focus on how UCF plans to tackle one of the best teams from the SEC, and how little respect UCF has been given throughout the season. “It would help a lot until next year when everybody forgets about it, and they look at all the games next year,” Frost said about what this game would mean for the AAC. But in a game that’s been deemed a Goliath vs. Goliath contest, Frost and Malzahn know neither team should be underestimated. But for a game that is revolving around an offensive showdown, defense will be a key. And with Davis out for Auburn with an illness not specified by Malzahn, UCF will have an easier time moving the ball down the field. In 2017, Davis totaled 36 tackles and one interception. But the Knights aren’t without injury either, as redshirt senior left tackle Aaron Evans will not be playing. Despite all that is riding on this game, not only for UCF, but seemingly the AAC as well, the biggest thing, at least for UCF, is that this is the final game of the Scott Frost era at UCF. Something that coach Frost admitted was “tough”, but something he wanted to do. Q: You did it as a quarterback at Nebraska, 13-0; how difficult is that road and what would it mean for to you do it as a coach if you can win tomorrow? A: Can you think back to when you took over at UCF when you were taking over the 0-12 team, what did you have to do to sort of build the team back up from that and juxtapose that atmosphere to what you’re seeing now? Q: As the American Conference tries to push itself to be considered one of the power conferences, what would a win tomorrow mean for the state of the Conference, the future of the Conference and the perception nationally of the American Conference? A: What’s the payoff going to be for you personally for putting yourself through this month? How is it going to shape you as a coach? Q: You addressed it and Auburn has addressed it, but how has Adrian dealt with the backlash to his comments and being the focus of national attention but especially in the SEC over the last couple of weeks since he said what he said? A: We try to teach our kids not to say anything that’s going to rattle the other team up. But A.K. is confident. I think if we were running a track meet tomorrow, he might win, I really do. But we’re having a football game tomorrow. We talked to him, and I’m glad he’s confident. But I’m pretty sure Auburn is seeing a lot of fast guys this year with the teams they have played. Knight Sports Now writer Zachary Winiecki also contributed to this report.